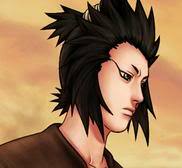 Personality: Airon has a moderate temper and is fairly nice to every citizen of the Sand Village. He is polite to the Kazekage and the Wind Country's Daimyo. Airon, a respectful man, is honorable and perferbly commits ways of glory. He shows off his kekkai genkai iron manipulation ability to set off certain examples to his students- usually if they misbehave or commits an unhonorable action. Airon usually dosen't open up to anyone but if the person seems kind of convinicing enough, he would act cool and all. Airon is an excellent observer and is creative. He studies enemy battle styles and their way of jutsu and creates ways to fight and counter them off, attempting to find search for any flaws or weaknesses. He is a very cautious man and a shinobi who is known to be resourceful and a opportunist. Weapon(s): Kunai, Shuriken, Summoning Scrolls, Senbon. Also carries a pair of iron swords on his back. Satetsu: Airon's fighting style centers on his manipulation of Iron Sand, as he can channel his Jiton chakra to freely manipulate iron. This is typically used for long-range purposes as the iron sand can be shaped and formed into anything Airon wants to attack the opponent from a distance while providing a solid defense for himself. The iron sand is a versatile fighting tool. Airon can also use Jiton to magnetize ninja tools and manipulate them. His elements are Earth and Wind, and he can use powerful ninjutsu from both fields. He knows some Taijutsu, but rarely gets into barehanded combat. Genin Arc: Airon was an orphan, abandoned at the doorsteps of a retired shinobi family by his real parents. He grew up never wondering if the family he knew was really his or not. His family treated really nice and they were extremely kind and gentle to him. Airon graduated as an average in the Ninja Academy at age 10 showing only above-normal skills in ninjutsu. He performed missions with his two currently deceased teammates Kijasha and "Pua", along with Yoku-sensei. Their teamwork were great, knowing he had finally gotten some friends, Airon was happy with his cell performing missions with little death risk. He was good at Doton ninjutsu, ningu usage, and shape manipualtion. His ablities were tested at the trails of the Chunin exams at age 13. His keen eye and intellect succeded him through the 1st part of the Exams. In the Forest of Death, he had to fight off an Iwagakure Genin with only a kunai. However, in a miracle long thought by Airon, when his fist was able to knock Airon out, in a frightened state, the metal tip of his kunai extended and violently stabbed into his ribs! Advancing with hours left to the 3rd part of the Chunin Exams, Airon had to face off a master of ninja tools. Airon was able to defeat him easily just by getting close to him, when suddenly all of the attacks by the shurikens and kunai were strangely connected at him! In the final part of the exams, Airon had to face off a Sand puppet master and his best friend- Kijasha. Kijasha was a far more popular student than Airon and the victor was decided before he was chosen. Airon didnt have a chance to defeat Airon, but then he did something he ahdnt done before- observing his own style. He realized that every metal object he had gone close to was able to be used by him, and Kijasha's puppets were full of metals! Weaving a single handsign and getting close to the puppet.. Airon shattered it without even touching it! He then overcame Kijasha with his ninjutsu and at the end was judged. Jounin Arc: Close to mastering all of his bloodline's secret techniques, Airon was directly promoted into a Jounin due to outstanding mission service and cell leadership skills. He acquired pupils of his own and was nicknamed the "Iron Bender" in the Bingo Book. An expert at Iron Sand usage, Airon is strong and fast proving his Taijutsu was just as good as his Ninjutsu and he's able to survive without Iron Sand.He has normal swordsmenship skills with his iron blades and is able to manipulate its metallic structure at will. He rarely spends time with his old sensei since their Doton and Raiton training is nearly done. Airon's strength and unique power was increased mostly by pain and determination. During the last Great Ninja World War, he had witnessed the deaths of his closest friends and comrades Kijasha and Pua. That rage turned on Airon's hidden powers and in a flash he is able to kill small armies of enemy shinobi. He has recovered from the pain but never forgot what had happened. Airon is now usually seen in missions rather than training. He spends time with his students and is kind and is helpful to the kids in the streets of the Sand Village.